Back in my school days, I always looked forward to Friday afternoon. It was that time of the week dedicated for extra-curricular activities. Children from different classes would perform on stage in activities like singing, dancing, drama, debate and so on. We would have spent days together rehearsing our singing or practicing our dance steps. The group activities always made school more enjoyable. I still remember those songs we sang in the choir preparing for our annual parents’ day or those that we sang everyday in the morning at our prayer sessions. On most days, we had an hour dedicated to physical exercise and sports related activities. The number of hours spent on sports increased closer to our annual sports day. These were the things I took for granted because my school was focused on not just good academics but all round development of children. That’s what I thought most schools do. It was only when I came across Sarada Kalyan Bhandar, I realized that this luxury was only available to those who studied in selective schools that had the amenities and resources to support extra-curricular activities. Child welfare project: Children from 11 villages in the outskirts of Midnapore from economically poor communities participate from nursery to Class XII. So far, there are 619 children enrolled (316 girls, 303 boys). This number has increased from 542 in 2009. Coaching classes are held 6 days a week. Deep Rai, a Vibha Project Monitor, who visited this program in May 2010 reports that the morning shift classes are held between 6.45 – 9.am for classes V to XII after which children go to regular school which begins at 10.30 am. Evening shift classes are between 4 – 7 pm for classes lower nursery to IV. Due to this extra coaching, children are performing well in regular school exams. Study materials, uniform, winter garments are provided to children. Children participate in extra-curricular activities such as yoga, music, dance, drawing, physical training and games. In terms of nutrition, milk is provided thrice a week, fruits, sprouted grams and molasses are provided at least once a week. Health check-ups including regular blood grouping, eye, dental check up, de-worming vaccinations, serious ailments checkup by pediatricians are all provided under the program, also bringing in awareness of hygiene and clean sanitation facilities. 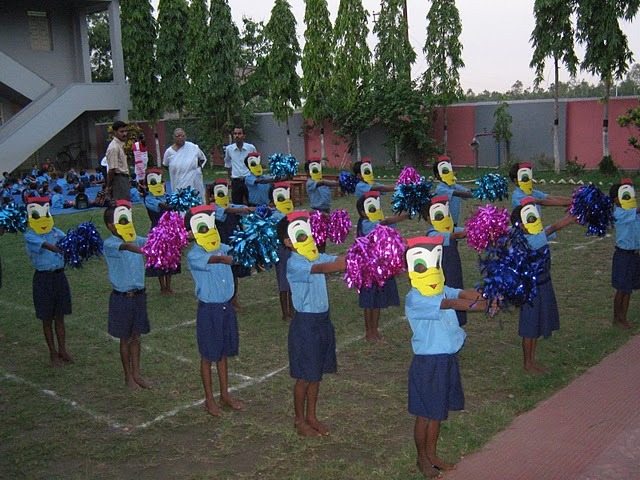 Annual sports day is conducted. Computers are provided for learning. Higher education: Those students who would like to further their education from higher secondary to under-graduate and post-graduate studies including medical, engineering and other technical or vocational mainstream programs are extended scholarship and financial support until they complete their higher education. There are 428 students who have enrolled in this component so far. This program recognizes the talent in these young individuals who can now bring out their full potential for the betterment of the society. Sukanta Paria and Dilip Sansal are two of the many shining examples of the successes of this program. They could pursue their further studies due to SKB and now, Sukanto is a staff member and Dilip who holds a doctorate degree is a volunteer with SKB. Girl child efficiency development: This program focuses on girls who can be groomed from childhood to womanhood to develop their full potential through education, good health and extracurricular activities so they can be a meaningful part of the society in the future. Women self-independence: This program focuses on women’s education and preparing them to be economically stable by utilizing their talents inculcating self confidence in their abilities. This is meant to make women aware about their rights and to prevent social evils like early marriage, torture and atrocities that women have to tolerate and help them contribute significantly to the socio-economic structure of the society. Girls from the girl child efficiency development program enroll in the women self-independence program for their higher studies. Deep Rai talks about the commitment and drive of Mrs. Rekha Sarkar who is leading the child welfare program. He describes the ambience of this school being cheerful, light, airy and full of energy with the children very enthusiastic to learn and participate in group activities. The teachers were conducting the classes in an interactive manner instead of just lecturing the students. He talks about children singing with beautiful voices during their music lessons and children performing intricate postures and meditating during their yoga classes. According to him, the strong point of this program is the keen leadership of Mrs. Rekha Sarkar and the dedicated staff members. The best aspect of this program is that it means so much to the SKB alumni that several of them such as Sukanto or Dilip are now volunteers or part time teachers due to the positive impact it is having on its local community. To read more about SKB, visit http://www.skbcharity.com or make a contribution today so you can reach out to the children of Midnapore who deserve an equal opportunity to education, health care and overall development. Heads or Tails : Should NGO’s like Vibha fund, ‘few major projects’ or ‘many small projects’?